Reversing climate change means investing in green energy, and as the sustainable sector grows, ensuring it grows in both developing and developed countries. 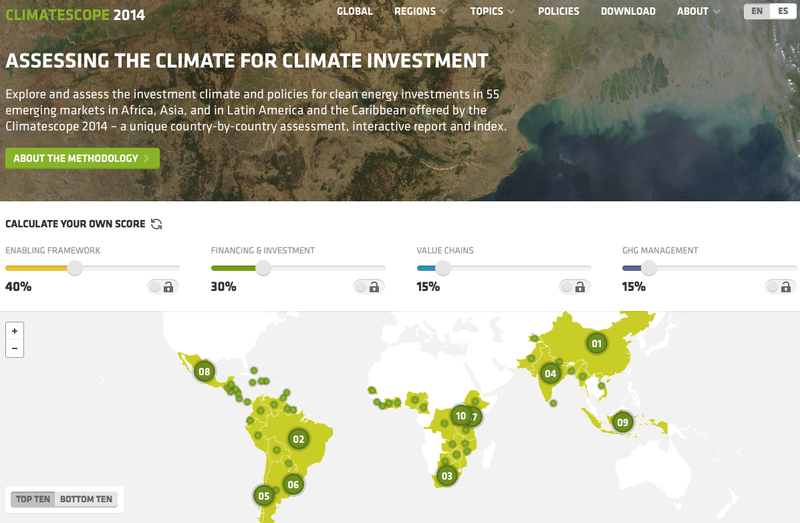 We worked with the Fondo Multilateral de Inversiones and Bloomberg New Energy Finance to launch a vastly expanded Climatescope, to provide open data about green energy investment in 55 countries. The data provided by Climatescope creates an information-rich environment for green energy investors. It also provides valuable data on clean energy policies for activists and policymakers. The site takes a very thoughtful approach to opening information. All the data powering the Climatescope site is available through an open API, which you can easily integrate into your own applications. The full dataset is also available for analysis. On almost every page lives a download button that provides a CSV file containing whatever you happen to be viewing. Most importantly, FOMIN got the licensing right. The data is licensed CC-BY. It can be used (with attribution) by anyone, even for commercial purposes. This is critical when you want data to encourage commercial activity. Moreover the website itself is also open and is licensed GPL 3.0. The entire site can be forked by other open source projects. Like most of the sites we build, Climatescope is a fully interactive site without a database or a heavy CMS. Climatescope users can manipulate, interrogate, and download the data on any device and in low bandwidth requirements. The site uses Jekyll, Angular, and D3 and is hosted on Github. Read more on our approach to CMS-free websites. People have different priorities when evaluating the environment for clean energy. The site is designed for a range of users, from activists to journalists, politicians, environmentalists, and the curious. FOMIN is committed to giving Climatescope users full control over how much weight each metric carries. To accomodate this, we built simple, intuitive sliders. Movement in one slider spreads the difference evenly across the other three factors. You can lock any slider to make it easier to hit an exact breakdown.